Black workers at Thurgood Marshall Airport are concentrated in the lowest-paying and lowest-status jobs, earning as little as $8.50 per hour. A decade ago, food service workers at Baltimore’s Thurgood Marshall International Airport were getting ready to land a union contract. But then a new developer took over the airport’s concession businesses, and their economic prospects took a nosedive. The workforce has fallen into a familiar rut of poverty wages and dead end jobs, say labor advocates, in glaring contrast to the sky-high profits raked in by their bosses and the overarching retail developer. According to a new survey published by UNITE HERE, part of an organizing campaign that the union has been pursuing since 2012 against the concession developer AIRMALL USA, the Thurgood Marshall Airport (BWI) is saddled with a “development” scheme that has dragged down the local economy. 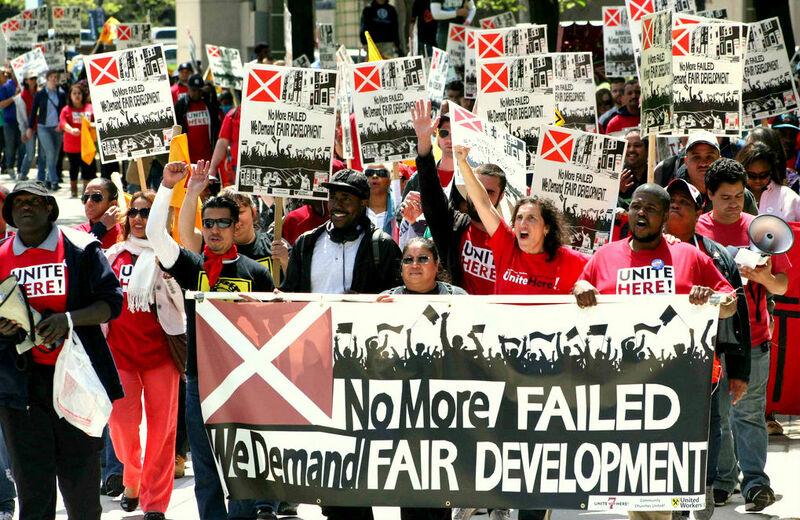 Previous research by UNITE HERE and Good Jobs First blasted AIRMALL’s management structure, which segments the workforce across individual concession outlets, for promoting precarious jobs in communities already strafed by racial segregation and poverty. When AIRMALL first landed at BWI in 2004, concession workers were campaigning for a union, but were blocked when then-Governor Robert Erlich moved to restructure airport concessionaires by getting rid of the previous operating company, Maryland-based firm HMS Host. Instead of a union, the workers got AIRMALL’s developer-based tiered business structure, which made them unable to unionize under a single employer unit. Unionization drives must now be undertaken piecemeal, at individual BWI concessionaires. Workplace justice struggles at airports have become a flashpoint for advocacy by community groups sick of over-hyped development schemes. According to research by the University of California, Berkeley’s Labor Center, nationwide airport workers have seen their wages decline over the past two decades, reflecting a wave of deregulation in the aviation industry and mass outsourcing of service jobs. And the once-solid jobs of ground-support workers like baggage handlers are now marred by high turnover, little access to union representation and diminished power to negotiate employment conditions. But amid labor struggles against outsourcing and predatory commercial development, airports are also providing a launchpad for a fresh wave of labor mobilizing by unions and community activists. In May, contract service workers, many of them low-income immigrants and people of color, at three New York–area airports (JFK, La Guardia and Newark), voted to join the SEIU Local 32BJ, opening the door to multi-site collective bargaining. Chicago’s O’Hare and Midway airports have seen a flurry of organizing activity, with UNITE HERE organizing concession staff and SEIU mobilizing low-wage service workers such as cabin cleaners and wheelchair attendants. In several cities, including San Francisco, Philadelphia, SeaTac in Washington (the town surrounding the eponymous airport) and Los Angeles, policymakers have sought to lift up airport job quality through living wage and community-benefits mandates, which compel developers and government contractors to provide decent pay and benefits to local hires in exchange for the profits they reap with the support of government permits, taxpayer-funded infrastructure and public services. The San Francisco Airport Commission launched a pioneering program in 2000 aimed at improving working conditions by enhancing wages and benefits, and strengthening through training. It was a good deal for both workers and passengers; improvements in productivity and job satisfaction followed, and turnover dropped. According to Anastasia Christman, policy analyst with the National Employment Law Project, government mandates and unionization can be complementary organizing strategies. Even if the unionization effort isn’t yet ready for take-off, BWI concession workers are getting a lift from fellow airport laborers nationwide, as they defy corporate developers by charting a more balanced course to economic empowerment.